Bluebirds are some of the most sought after backyard birds. The key to attracting bluebirds is to meet these birds' specialized needs for food, water, shelter and nesting sites. *Food: Bluebirds consume a wide variety of insects, offering daily meal worms before and during nesting season is the first step to getting their attention. These birds will also eat a wide variety of berries, such as sumac, holly and elderberry, and adding these berry-producing shrubs to the yard will help create a bluebird-friendly landscape. 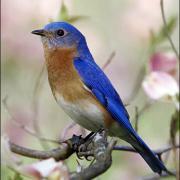 *Water: Bluebirds require fresh, clean water for drinking and bathing, and a low basin with 1-2 inches of water is ideal. Moving water with a bubbler or small fountain will attract their attention more quickly, but choose a birdbath design that is large enough to accommodate bluebird family flocks that may have a dozen birds all vying for a drink. *Shelter: Choose just a few mature trees and opt for low ground cover surrounding open grassy areas to provide these ground-feeding birds security while foraging. Berry-producing shrubs that are a good food source are an excellent choice for plants that will do double-duty as food and shelter. In winter, supplement bluebirds' shelter with medium or large roosting boxes to provide shelter from storms and freezing temperatures. *Nesting Sites: Bluebirds are cavity-nesting birds, and they will regularly nest in wooden bird houses of the appropriate dimensions, which should ideally be placed 4-7 feet above the ground in open areas. Putting out nesting materials such as pine needles and cotton scraps may attract bluebirds' attention to the houses. Monitor bluebird houses to discourage house sparrows and European starlings that may usurp the nesting spots and could harm the bluebirds, and clean bird houses after each brood fledges to encourage additional nests. HAPPY BIRDING!